After our sortie on Hungry Hill using Lynch’s ‘Munster’s Mountains’ back in May we might have expected another challenge in the wilds of West Cork! 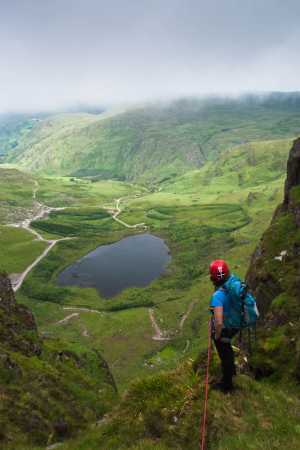 We resolved to tackle Cork’s highest mountain via a gully from Lough Akinkeen described in Lynch’s book. There is room for only one car at IW 02229 65760 B by a gateway onto a forestry track where I was bitten alive by clouds of horseflies and midges before I’d even had time to don the DEET! The recently surfaced track leads steeply upwards to the pine fringed lough situated at 300 metres. Close to the tree line it splits; one branch leads straight through the trees toward the shore, the other trends right running around the SW shore to bring the climber close to the steep cliffs of Lough Akinkeen. There are several near vertical gullies etched deeply into the cliff face. The one we chose is above a fence, contains a small stream and is to the right of a long unclimbable gully that shoots leftwards toward the highest point of the cliffs. Leave the path and cross the fence below the gully. Climb about 100 metres up through long grass and heather to reach the bottom of the gully. The 200m gully, described separately, was wet, much vegetated and the rock was green with slime and greasy to climb. Near the top, the views of Lough Akinkeen, Knockantooreen and Carran were inspiring until cloud suddenly descended. An eerie silence ensued as wafts of mist enveloped us in a ghostly embrace. As we trudged uphill through the heather towards the cairn on Caoinkeen the wind picked up and visibility was poor. The ground is very boggy hereabouts and I had my first experience of planting my feet on what I thought to be terra firma only to find myself sinking rapidly into shin deep bog and unable to extricate myself. Fortunately mcrtchly was on hand to haul me out of the mire that very reluctantly released me with a disgusting sucking sound. Suitably soiled we continued S-SW past the trig point towards Knockboy some 2.5km distant. The wind was now driving droplets of rain that landed on our Gore-Tex jackets and hats with a constant strident hiss. Passing Lough Nambrackdarig over hummocky terrain interspersed with rock, heather and thick carpets of bog, the rectangular silhouette of the trig point at Knockboy finally appeared through the gloom.